Home › Articles & Reviews › The Silvers “Running Away” Hits #1 for Pop Music Iowa – #21 in USA for All Genres! 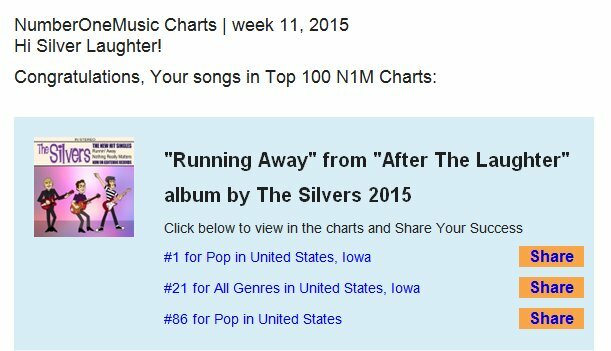 The Silvers “Running Away” Hits #1 for Pop Music Iowa – #21 in USA for All Genres! This is one of those music sites that has a limited audience, but we will take what we can get! For reference, “Turn It Down” hit #13 for the same category. So we are getting some listens from this site, that’s for sure.